It really is hard to believe how fast this course is actually going... It's the start of second and (hopefully) my final year of studying to become an OT! It feels strange not being a newbie, I remember this time last year feeling terrified of what i had signed up for. In fact my key term this time last year was 'Overwhelmed! ', so I can totally understand how the first years were feeling when I had a chance to meet them at coffee time yesterday. full of all the same questions I had about the unknown of workload, placements, and PRESENTATIONS! It has given me time to reflect on the difference a year makes... If you had told me this time last year that I would have, not just survived first year but passed it, I'm not sure I would have believed you! Last year I didn't know what to expect and that scared me! This year I do know whats coming and I can't decide if that scares me less or more! I know the hard work that's coming with 2 assessed VIVAs (one in less than 6 weeks), a group presentation, a dissertation and 2 placements at level 6 which feels like a mountain in such a short space of time. But I know I can do it, I can pass assessments at masters level! It's not impossible!! So what is terrifying me the most? It is this time next year It will be over and I'll be job hunting, I'll be an OT (Thanks to the lovely tutor that reminded us of that on day one of second year!). I'll need to be able to utilise the skills I'm learning every day to help people and make a difference to them, to keep them safe and also mange to do so within the constraints of service provision and at times with limited resources. 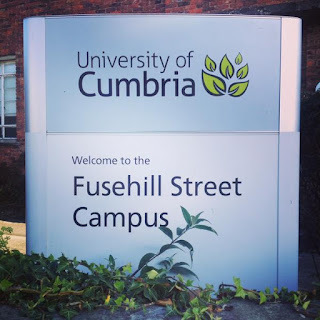 I'm excited to be back in university, to increase my knowledge, to make the most of opportunities to grow and develop so that this time next year, I might be terrified to be starting out as a qualified OT, but I will know I have the gained as much of the skills I can to be starting in the role! To any first years starting out: Make the most of it! It will feel exciting and new but may also feel scary and overwhelming - remember others have been there and survived those moments; support your class mates they will most probably be feeling the same, if not at that very moment at some other point. Speak to the second years, we want to help and support you! And most of all don't be scared to ask questions! At the end of welcome week last year I talked about meeting a great bunch of people who I felt would make the next two stressful years a lot of fun and one year in I can share that they have done much more than that! They have made me laugh when all I wanted to do was cry, made the hardest assignments bearable and giving me chances to just be me and share the unique skills I have in the stuff that we have been doing. I'm in a class of enablers and if you are on an OT course, I bet you are in a class full of them too.